In this article we will look at concealed carry lifestyle, training, and practices that can help you to achieve good concealment habits and mastery of the art of concealed carry of a pistol. My recommendation that you attend a course on carrying a concealed pistol that allows you to use all or most of your various concealment gear and garments. While attending a training course you will be able to get feedback on your concealment techniques. After the course, continue to train on your own and with others with similar training, to master both concealment and access. Have someone watch you while you are concealed, the person assisting you should have similar training and understand how you may accidentally expose your pistol. If you are out in public when doing this it would be wise to have a prearranged signal for them to indicate to you that your weapon system has been exposed. This type of feedback may help you to avoid future problems. Evaluate your personal attire for concealment, as well as comfortable carry. This may amount to trying on various types of garments, belts, and gear to determine what works and does not. Never carry concealed in public without ensuring that you have a system that works. Locked room – Bedroom, office, single bathroom, etc. Restroom stalls – It is recommended to have a plan for this and avoid very public restrooms, especially those with stalls that are open on the bottom and may or may not have doors. Inside Vehicle – Look around first before you start arranging your gear. This will include looking for people in your immediate area and beyond. Also be aware that when in public parking areas you could be on a security camera that could be monitored. Dressing Room – Look for those that are completely in closed and do not have one-way viewing glass or hidden cameras. Many of the above locations are not always the best for performing checks and rearranging equipment. They leave you open to be surprised by some unsuspecting citizen if doing a check in a public place. The best place to check your rig is in a locked room or other location where no one can walk in on you. If the door does not lock, you can momentarily block it. When checking your rig in an area where it is possible for some one to see you always look around and listen momentarily before checking or altering your rig. When getting up from a seated location check your rig to ensure that you have maintained retention and concealment before getting up from a seated position. Learn habits in you movement and conduct that will prevent unintended exposure. Having quality, functional gear and concealment garments that are suited to concealed carry can aid tremendously. If you have a rig or garment that is so uncomfortable or unsuitable, then change it as soon as possible. 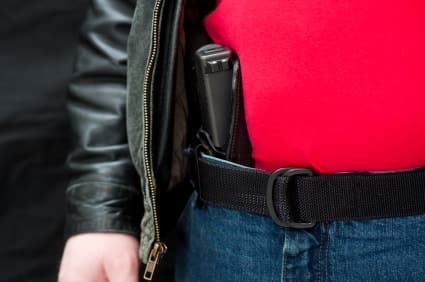 It is never recommended to unholster your weapon except when initially holstering or storing the gun, such as during an administrative loading or unloading procedure at home. Finally, the best training of all is to carry all the time. Printing – Allowing the outline of the weapon or accessories to show through the concealment garment or device. Exposing – Allowing the handgun, holster, or an accessory to unintentionally exposing part or all of it in plain view in public. Be cautious when reaching upward, leaning forwards or sideways, kneeling down, or reaching for anything in your pockets. Touching – A habit of touching or repositioning the handgun, holster, or an accessory in plain view. If this must be done, do it from a concealed location. Looking – A habit of looking at your concealed gear to verify if its there or if it is still concealed. Especially avoid this if someone is staring at you. Learn how to subtly screen your movements or distract the on looker so that the possibly exposed item can be turned away from their view. Active telegraphing – Body language and motions such as getting into a combat stance without the need to. This might also include noise that your weapons make during carry such as loose ammunition in a magazine, a squeaky holster, or other noises. Passive telegraphing – Clothing or items worn which might indicate that you are carrying or that you are involved with firearms. It is not recommended to wear hatpins, lapel pins, tie-tacks, jewelry, logo clothing, or other adornments that might indicate you are a “gun person”. In some cases the wearer may be subject to an on looker who will see the original indicator, then looking you over until they locate where you are carrying. Bumping/Sounding – Making contact with an artificial surface or when bumping into someone. The weapon may make a sound or someone may feel it. Very few things a person would carry feel or sound like a weapon. Be aware of items that make unnatural sounds as well what will give you away will also give others away. Forgetting – Forgetting that you are carrying concealed. This is certainly possible when carrying a very comfortable system, or one that is small or lightweight. It is also possible when the user has not developed a sound concealed carry regimen or is used to carrying. Responsibility mandates that you not let this happen. DROPPING – Dropping an item, such as a magazine, or worse your weapon from concealment. Often due to equipment that does not adequately retain the item, not re-securing the item following a change. In positioning of concealment gear or wardrobe, this can be cause by activities like: a visit to the restroom, exiting a vehicle, getting up from a chair, or not being aware of changes in body position and activity can affect the concealed carry system. In closing it is up to you the CCW permit holder to practice, practice, and practice more. By attending professional training courses, and practicing on your own every day you carry a pistol.